Take Me Home Travel Homes are the perfect way to take your pet on a trip. Travel Homes feature a convenient carry handle, large access door and a durable plastic base for easy cleaning. 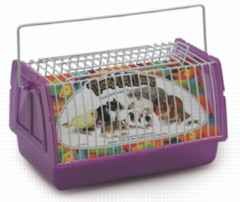 Travel homes are safe for both small animals and birds. The home comes complete with a perch for birds that can be easily removed when used for small animals and is available in multiple sizes and a variety of colors. Let your pet travel in first class in the Small Come Along Carrier, a cozy and comfortable fabric-covered pet carrier. The ultimate carrier for convenience and comfort, Come Along features fresh air vents, a handy storage spot, E-Z Carry handle and E-Z Zip double zipper design. Come Along Carriers can be combined with the Take Me Home Travel Home for the ultimate travel system.